First of all chop off the hard stems from Mustard greens, bathua and spinach,no need to remove the soft tender stems. Wash the greens in enough water 2-3 times to remove all the mud and dirt. Chop the greens roughly and peel the turnip and chop into small pieces. In the pressure cooker add all the chopped greens, green chilies ,turnip and half quantity of chopped ginger along with 1.5 glass of water. Close the lid and Pressure cook on medium heat for about 7-8 whistles. Then let it cool down and then open the pressure cooker. Now blend it with a hand blender and make a coarse puree. Don't make it into a smooth or fine paste. Now sprinkle the maize flour on the greens ,add 1 tsp at a time and then mix with a spoon. if you add all the maize flour together then it become lumpy.so add little,mix and repeat. In rural areas and villages they use a wooden mathani to blend the saag and it was coarse in texture.you can also blend it with a wooden whisk/mathani if you can. Heat 2 tbsp ghee and 2 tbsps of butter in a pan and add grated ginger, chopped tomato and salt and cook till tomato become soft and mushy. Now add this tomato mixture to the Sarson saag and mix. Cover the cooker with a plate and simmer for about 15 -20 minutes so the maize flour also get cooked else it may taste raw. When you want to serve the saag then make this tadka as a garnish- Heat 1 tbsp of ghee in a small pan and add cumin and asafoetida. when it start crackling remove from the heat and add red chili powder and pour over the sarso the saag. 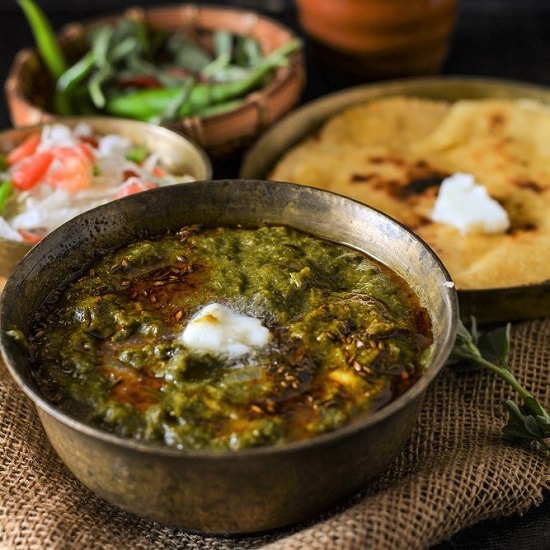 Serve garam garam Sarson ka saag with makki ki roti ,salad ,pickle and buttermilk and off course with a dollop of butter on Top !! 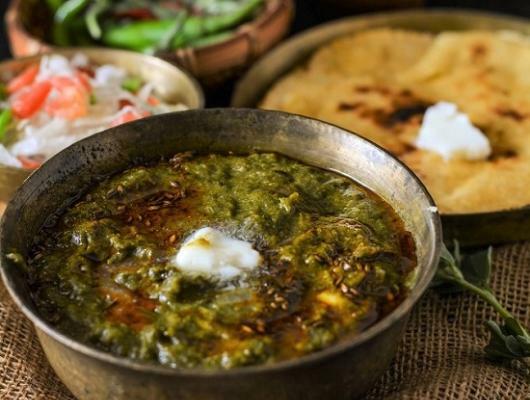 Sarson Ka saag is a very popular winter specialty from the state of Punjab and now very popular all over India. It is a seasonal delicacy and best enjoyed with Makki ki Roti ,white makkhan and buttermilk during winters.